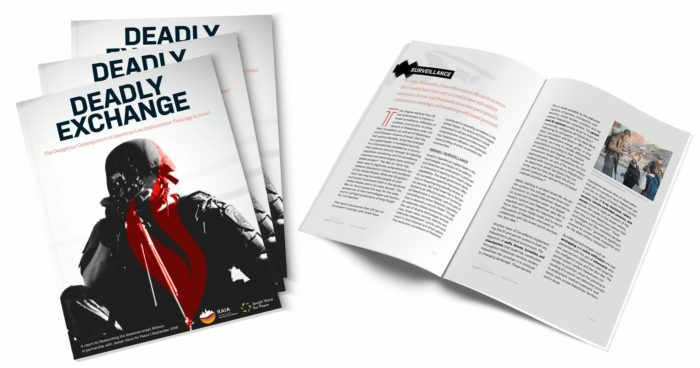 The JVP Sanctuary Mezuzah Project is the result of a collaboration between JVP National staff, members of the Chavurah Network, members of the JVP Rabbinical Council, members of the JVP Artist Council, and artist and JVP member Emily Rosenfeld. Throughout the first two weeks of March, this special artist-designed mezuzah was available for purchase for $50, and includes the cost of JVP membership for one year. Throughout this two-week member drive we expanded our community by bringing in over 200 new members to JVP. Update: The drive is now closed. Thank you all for the huge showing of support and your kind words! If you didn’t get a chance to buy the sanctuary mezuzah, you can visit JVP’s collection of other Social Justice Judaica here. In honor of this drive we are making an organizational gift to Mijente, a national hub for Latinx and Chicanx organizing, and encourage others to do the same. 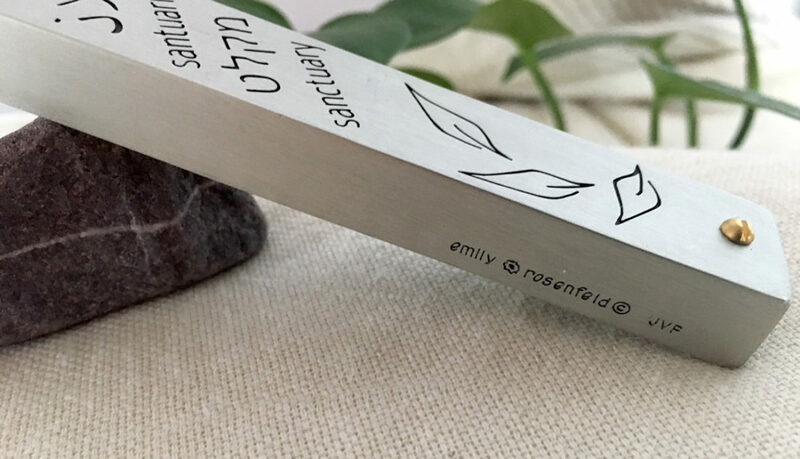 Artist Emily Rosenfeld worked with JVP to design this mezuzah specifically for this project. On the mezuzah, you see the word ‘Sanctuary’ written in English, Arabic, Spanish, and Hebrew. Each mezuzah will come with some literature on the significance of this piece, along with a couple of options you can cut out, roll up, and insert inside your mezuzah. One of these options is a poem by JVP Artist Council leader Aurora Levins Morales (more information about Aurora below). With this symbol on our doors, we mark our homes as a sanctuary. Likewise the space outside our door frame. Who might be standing at the threshold, in the holy space outside our front door? Is it a neighbor facing deportation? A person who is hungry or underhoused? A person fleeing a violent home or workspace? Our own tired, troubled soul? Or that of the beloveds who live with us? The mezuzah says that we are welcome in our vulnerability and need. It says that we can breathe in kedusha, holiness, sanctity. And we can breathe it back out into the world. Both directions. The traditional text of the mezuzah reminds us to love God ‘with all our heart, with all our soul and with all our resources [one interpretation of me’odecha]. May this mezuzah remind us to act justly with all of the love in our hearts, with the strength of our souls, with whatever resources we can muster, to provide sanctuary to those who are oppressed in our world. JVP’s Jewish values are about working towards a safe, free, and just world— for us and everyone. And that means standing up against Israeli occupation and apartheid, and for the right of Palestinians to live in freedom and dignity. 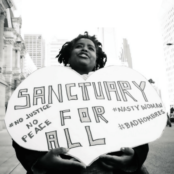 It also means standing up against ICE deportations, and policies that tear immigrant and refugee families apart. It teaches that when we say “Never again,” we mean “to anyone.” It teaches that it’s on us to stand up for what’s right, and that the time to stand up is now. What is a mezuzah? Find out more here. If you would like to to buy a hand-written klaf, we have connections with several sofrot (women scribes) – email mezuzah@jewishvoiceforpeace.org with subject line: “klaf”.